Pit carts and the equipment they compliment have become a staple of pit lane. 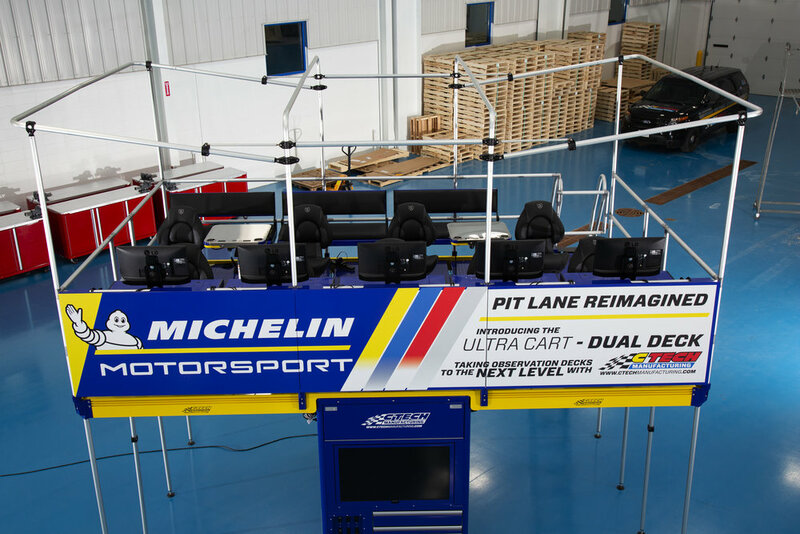 There’s no denying over the years they’ve become steadily bigger and more complex, but it’s been decades since a single pit cart has come along and really changed the way professionals, fans, and sponsors fundamentally view pit lane. The new Ultra Cart ‘Dual Deck’ does just that. On paper, it seems to be way over the top. Then again, much of the racing business is. What originally made the Ultra Cart so popular was its size and method of organizing equipment as well as people on pit lane. The ‘business of racing’ explains a lot about why teams do the things that they do. Pit lane isn’t just about changing tires and fixing race damage; it’s also about hosting and applying a growing bank of real-time data, entertaining sponsors and guests, and making sure that crew members have everything they need throughout the duration of a race. There’s always more going on behind the scenes of the big show, and pit lane is no exception. 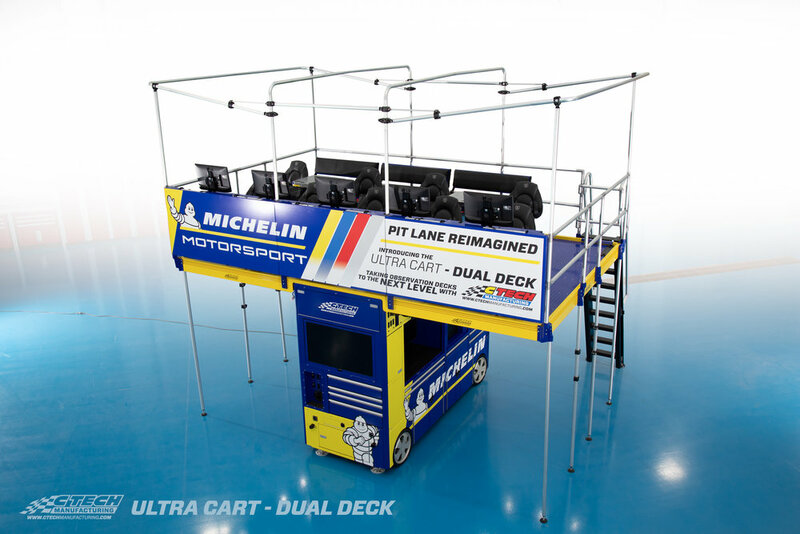 The new Ultra Cart Dual Deck was designed with the business of racing in mind. Nate Birkenmeier, our Motorsports Product Line Manager, has collaborated with some of the world’s top racing organizations (Penske Racing, Richard Childress Racing, Stewart/Haas, and many more) to bring this next generation pit cart design to fruition. The expanded upper deck allows more working crew to concentrate on crunching numbers and coordinating race strategy, while additional bench and swivel seating allows for more sponsors and guests to enjoy a one-of-a-kind racing experience. The cart chassis itself is designed to sit perpendicular to pit lane as opposed to parallel to it, which is traditionally how they’ve been oriented in the past. 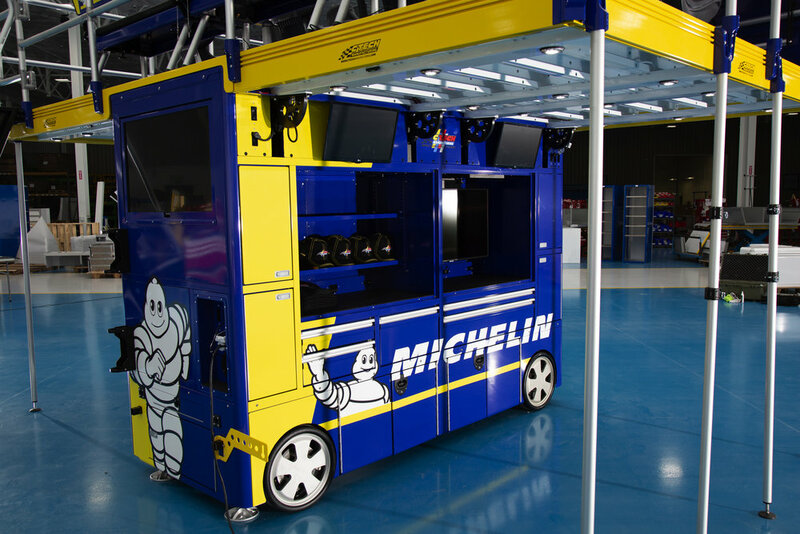 This allows for hands-on crewmembers to move from the rear of the pit box to pit wall without having to go around the cart itself. Lightweight panels hung across the upper deck railing provide expanded promotional space for sponsors as well. These are all advantages that promote better business for race teams as well as improve performance on race day. Both of which are paramount to racing glory. The first Ultra Cart Dual Deck to ever be produced was seen by the public eye for the first time last Friday at the Performance Racing Industry show (PRI) in Indianapolis. It’s only fitting that the first example was the centerpiece of our booth. Adding to the spectacle, it was a real working example that was to be shipped to its recipient; Michelin Tire, at the conclusion of the show. 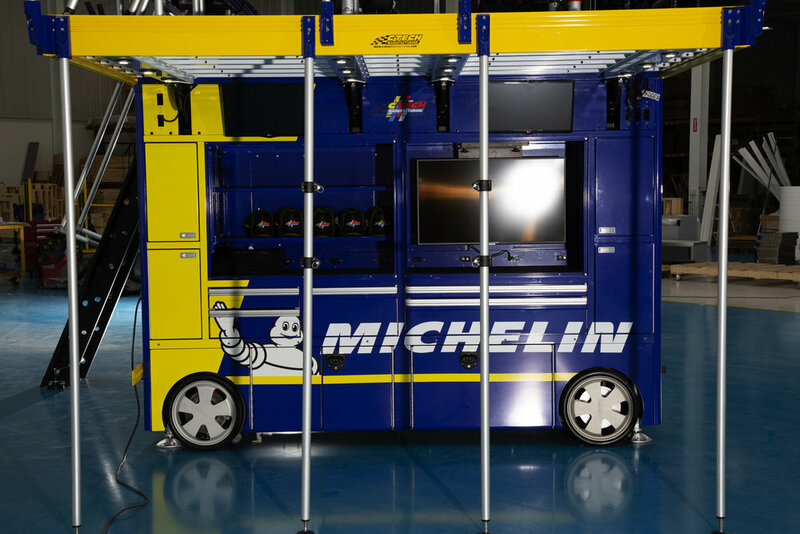 With Michelin stepping further into their IMSA competition partnership this year, it was paramount that they had a pit cart of this stature to support the incredible engineering efforts that come with providing thousands of tires to an entire world-class racing series every weekend. Underneath its skin, the Dual-Deck Ultra Cart houses a vast array of electronic, networking, and pneumatic distribution technologies. All of which have been refined from the original Ultra Cart design and will be configurable based on the buyer’s requirements. 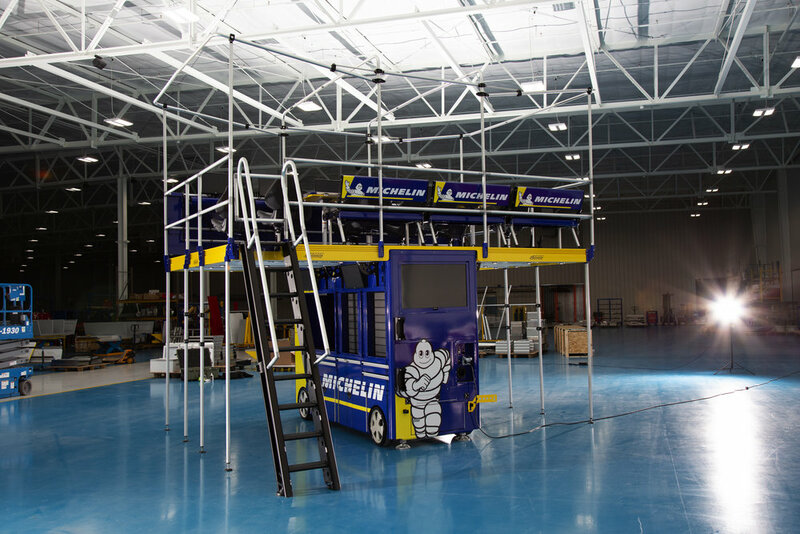 As it sat at the tradeshow, Michelin’s “Ultra Cart Dual Deck” was sporting 13 solid-mounted computer monitors, capable of being independently operated or linked for multi-screen viewing. Expanded chassis storage, nitrogen cradles, MotionLatch® drawers, counter space workstations, and LED lighting round out basic features found in the cart chassis itself. 4-wheel steering, 4-wheel hydraulic disk brakes, and FlatFree tires ensure that the entire ~3500LB cart remains readily mobile. At the tradeshow, a single person was able to maneuver the cart into place on carpet, thanks to the use of ceramic bearings. Another interesting fact; the two decks are self-supporting during setup and take-down thanks to a clever counterbalancing system. That means one person can easily take out the supporting poles and ease the entire deck back into its stowed position and vice-versa. Our Project Manager and Engineer, Brad Oberbeck, was instrumental in the design and construction of this new cart, and we can’t say enough about his efforts! Our commitment to staying ahead of the curve and placing emphasis on innovation is what made this incredible new cart possible. As we enter our 25th year in business, we’re proud to look back on our past projects, but we’re especially excited to look ahead to what the future holds!